A lunchtime workshop on Friday 5 April will look at PrEP conundrums and we welcome case presentation on topics such as toxicity challenges, indeterminate HIV tests on PrEP, etc. A cherished tradition of the conference is a session of Clinico-Pathological Case presentations by specialty trainee registrars. This is a popular session and provides a forum for registrars to present in front of the UK HIV medicine community. The session will be co-chaired by Professor Mark Bower from Chelsea and Westminster Hospital, London and Dr Ula Mahadeva from Guy’s & St Thomas’ NHS Foundation Trust, London. Three cases will be selected for presentation at each of the lunchtime workshops at the conference. Please read the guidelines below before submitting an entry. a) All entries should be in Microsoft Office PowerPoint format, with slides in a 16:9 design aspect ratio. b) The presentation should take no more than 10 minutes to deliver orally, allowing 5 minutes for questions and interchange. c) The presentations should be interactive, and an audience voting facility will be provided via the Conference App. You should include a minimum of 3 question slides within your presentation, on which the audience can vote on suggested answers. The maximum number of potential answers allowed per question is 5.
d) You should include a slide with learning points. Entries for the Clinico-Pathological Correlation session must be submitted online via the conference website by Friday 1 February 2019. Entries for the PrEP conundrums session must be submitted online via the conference website by Monday 11 February 2019. The entries selected for presentation will be chosen by the co-chairs and both successful and unsuccessful entrants notified by Friday 15 February 2019. The co-chairs will provide suggestions for improvement of the selected presentations by Friday 1 March 2019. 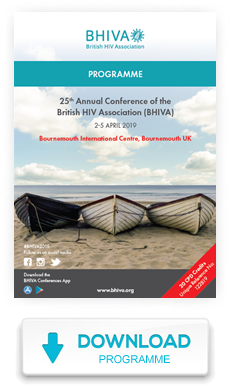 The finalised presentations should be emailed to conferences@bhiva.org by Friday 22 March 2019. The entries will be anonymised through the online submission process before being viewed by the co-chairs. a) Applicants are required to register for the conference prior to the relevant submission deadline of Friday 1 or Monday 11 February 2019. Case submissions from any applicants who fail to register for the conference will not be reviewed by the facilitators. If your case is not selected for presentation and you do not wish to attend the conference, a full refund towards your registration fee will be provided. b) The aim of the Clinico-Pathology case presentations is to discuss primarily the role of histology and cytopathology in the management of HIV disease. We will also consider cases where microbiology specimens contributed substantially to the diagnosis however; we do expect photomicrographs showing cellular microbiological pathology as well as macro pathology (e.g. culture plates etc.). Specific criteria for case presentations for the PrEP Conundrums session will be updated here shortly. c) Applicants are requested to remove any patient identifiable information from their slides, such as names, hospital numbers etc. d) The presentation should be based on a patient’s case (or a couple of patient cases) of which the entrant has good knowledge. There must be some images of histopathology, cytopathology and microbiology sample(s) from the patient. Entries including clinical photographs (with consent and not identifiable), radiology and relevant serological tests are also considered favourably. Cases with autopsies, particularly if autopsy histology is available, will also be considered. e) If images are not yet available at the time of initial submission of the entry, a slide entitled with the image can be left blank, to indicate that the image is being obtained with a full description of the proposed images to be submitted. We will expect these images in the final presentation and entries will be marked down if they are not presented. f) We also expect a discussion and learning points derived from this case to be highlighted which will contribute to improved management of the complications of HIV disease. g) Once submitted, your case presentation submission cannot be edited, please ensure that all the information provided is correct. The co-chairs will provide feedback to the selected entrants, so that their presentations can be optimised prior to presentation at this national forum. The standard of entries is generally high and do not be disappointed if yours is not selected this time. This may just be a reflection of the region / case mix of the other entries received at that round, and not an indication that your entry was lacking worth. For example, in each session the entries selected will aim to reflect a range of pathologies, in order to make for a varied discussion, e.g. if there are two TB cases only one is likely to be selected. Therefore, please consider re-submitting the same or another entry for the next round.